It was not until 1906, however, that Pentecostalism achieved worldwide attention through the Azusa Street revival in Los Angeles led by the African-American preacher Bishop William Joseph Seymour. He learned about the tongues-attested baptism in a Bible School that Parham conducted in Houston,Texas in 1905. Invited to pastor a Black holiness church in Los Angeles in 1906. Seymour opened the historic meeting in April, 1906 in a former African Methodist Episcopal (AME) church building at 312 Azusa Street in downtown Los Angeles. What happened at Azusa Street has fascinated church historians for decades and has yet to be fully understood and explained. For over three years, the Azusa Street "Apostolic Faith mission" conducted three services a day, seven days a week, where thousands of seekers received the tongues baptism. Word of the revival was spread abroad through The Apostolic Faith, a paper that Seymour sent free of charge to some 50,000 subscribers. From Azusa Street Pentecostalism spread rapidly around the world and began it s advance toward becoming a major force in Christendom. The Azusa Street movement seems to have been a merger of White American Holiness religion with worship styles derived from the African-American Christian tradition which had developed since the days of chattel slavery in the South. The expressive worship and praise at Azusa Street, which included shouting and dancing, had been common among Appalachian Whites as well as Southern Blacks. The admixture of tongues and other charisma with Black music and worship styles created a new and indigenous form of Pentecostalism that was to prove extremely attractive to disinherited and deprived people, both in America and other nations of the world. The interracial aspects of the movement in Los Angeles was a striking exception to the racism and segregation of the times. The phenomenon of Blacks and Whites worshipping together under a Black pastor seemed incredible to many observers. 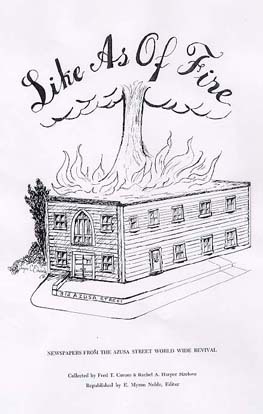 The ethos of the meeting was captured by Frank Bartleman, a White Azusa participant, when he said of Azusa Street, "The color line was washed away in the blood." Indeed, people from all the ethnic minorities of Los Angeles, a city which Bartleman called "the American Jerusalem," were represented at Azusa Street. The place of Bishop William Joseph Seymour as an important religious leader now seems to be assured. As early as 1972 Sidney Ahlstrom, the noted church historian from Yale University, said that Seymour was "the most influential black leader in American religious history." Seymour, along with Charles Parham, could well be called the "co-founders" of world pentecostalism.